Experience the varied history, architecture and exotic charm of Morocco’s cities, towns and villages. The ancient imperial cities of Rabat, Fes, Marrakech, and Meknes, with their medinas and maze-like twisting streets, historical monuments and magical souks, contrast dramatically with the desert towns of Erfoud, Merzouga and Zagora and the coastal cities such as Essaouira and Tangier – each place striking in its own way. Agadir is a popular beach holiday destination and fishing port located on the southern Atlantic coast. The stunning UNESCO world heritage village of Ait Benhaddou has some of the most exotic and best preserved Kasbahs. Located in southern Morocco close to Ouarzazate which is (the largest town in the region) Ait Benhaddou has been the setting for many films, including Lawrence of Arabia, The Mummy, and Gladiator. The old ksar (fortified village), situated on a hill across the Ouarzazate River from the new village, is largely uninhabited today and can be explored on foot. Azrou is an old Berber market town in the north of Morocco close to Meknes and Fes. The town lies in a wide, flat valley dominated by the mountain slopes of the Middle Atlas Mountains. In the nearby cedar forests you can find mature cedar trees, the largest more than 30 meters tall. 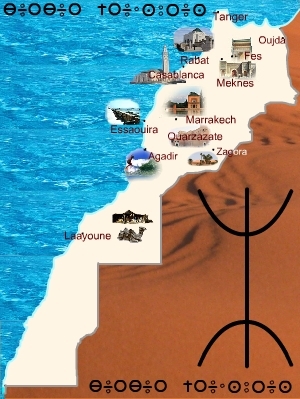 Casablanca is the largest, and probably best known, city in Morocco. 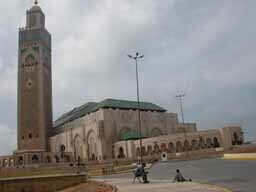 Located on the Atlantic coast, Casablanca is the economic capital of Morocco. The centre of business and industry, Casablanca has the country’s principal port, and its largest international airport, Mohammed V International Airport. The old and the new coexist from the original, walled medina to the modern Hassan II Mosque, one of the largest mosques in the world. Located in the Rif Mountains mid-way between Tangier and Fes, the small mountain town of Chefchaouen dates back from the 15th century. Maintaining a medieval feel, the town with the white-washed blue door buildings of the medina, is situated below two mountain peaks, and is still largely encircled by its 16th century battlements. Established during the French colonial period, the small town of Erfoud is the last town before reacing the sand dunes of the Sahara Desert and the desert fringe villages of Merzouga and Rissani. Inhabited since prehistoric times, today Essaouira is a relaxed, Atlantic coast town. A few hours from Marrakech, its location, temperate climate and blend of Portuguese and Moroccan history and architecture make it a favourite beachside destination. The town ramparts, white and blue washed buildings are reminders of the town’s history as a Portuguese trading port. The 18th century medina is a UNESCO listed world heritage site. The town is also host to renown annual Andalusian and Gnawa music festivals. Originally founded in the 9th century, Fes was Morocco’s capital for over 400 years and is one of the country’s oldest imperial cities. The city is one of the world’s largest remaining medieval cities and is famous for its history, architecture, cuisine and souks. The old walled medina encompasses remarkable historical monuments such as the 14th century Bou Inania Madrasa (medersa), Al Attarine Madrasa, Fes el Jdid Madrasa and the 9th century Kairaouine (Karaouyine) Mosque, as well as its many bazaars and souks (such as the Souk Ain Allou (leather), the Souk Attarine (spices), Souk au Henne (henna and kohl), the exterior of Dar el Makhzen (Royal Palace) including the enormous Merenid gate of Bab Dekakene, formerly the main entrance of the royal palace. Orient yourself with the panoramic view of Fes from the late 16th century Borj Nord fortress which overlooks the city. 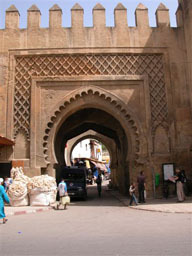 The very name Marrakech is evocative of all that is exotic and rich about Morocco. Famous among tourist for its souks (markets) and Djemaa el Fna Square (a bustling market square by day which gives way to a multitude of open air cafes at night), Marrakech is an old imperial town. The red walled medina’s many historical sights, the La Bahia Palace, el Badi Palace and Koutoubia Mosque offer a fascinating insight into the city’s past and present. 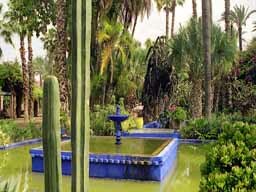 The city’s beautiful gardens, such as Majorelle Garden, offer a serene respite from the busy city centre. The history of the ancient imperial city of Meknes extends back as far as the 8th century when it is believed the area was first settled. Meknes is referred to as the Versailles of Morocco. 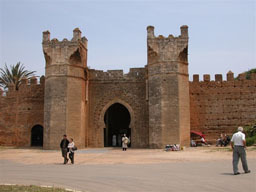 The old city’s famous massive gate of Bab el Mansour, is the main entrance to the second Alaouite sultan, Moulay Ismails’s, 17th century imperial city. The desert village of Merzouga is situated on the edge of the spectacular Sahara Desert sand dunes, the largest being Erg Chebbi. 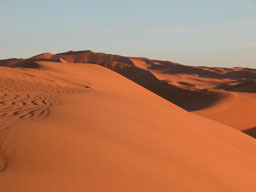 Merzouga is the starting point for camel safaris into the desert dunes and oases. The market town of Midelt lies between the Middle and High Atlas Mountains on the road from Fes in the north to Errachidia and Erfoud in the south. Strategically located on the cross-roads of an old caravan trading route Ouarzazate became a garrison town during the French colonial period. 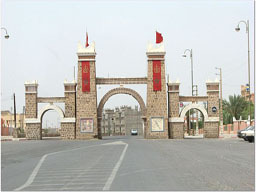 Parts of the old garrison still survive today. Now the movie making capital of Morocco, films such as Kingdom of Heaven, Gladiator, Star Wars, Kundun, Alexander, and Lawrence of Arabia weremade here. 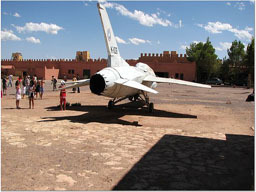 Sights include Glaoui Taourirt Kasbah and Atlas Studios (one of the largest film studios in the world). Ouarzazate is conveniently located for those who prefer to explore the desert region of the South (Skoura, Tineghir (Tinerhir), Todra Gorge, Dades Gorge, Fint, Zagora, the Roses Valley and Road of a Thousand Kasbahs) by day trips from a central base. Mohammed V Mausoleum, the Royal Palace (Mechouar) and the Necropolis of Chellah, situated in the ruins of the Roman town of Sala Collonia. Tangier is an important industrial coastal port city located at the northern tip of Morocco at the entrance to the Gibraltar Straights where the Atlantic Ocean and Mediterranean Sea meet. First established as a trading settlement by the Phoenicians, Tangier is one of the oldest cities in Morocco. Today the city is connected by ferries to Gibraltar and Spain. The southern town of Taroudant is situated in the Sous Valley to the west of the Anti-Atlas Mountains, An old caravan town, Taroudant’s medina is surrounded by a striking 7.5 km long wall. A short distance to the north-west of Fes, the Roman ruins of Volubilis offer a glimpse into the Roman past of Morocco. 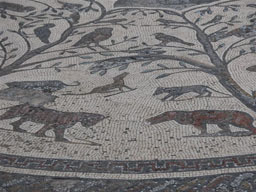 Located on a hillside overlooking a fertile valley, the ruins of this ancient town contain some marvellous mosaics. The remains of many significant buildings can be explored including the Basilica, Thermae, Temple of Jupiter, Capitol, and Triumphal Arch. a stopping point on the ancient desert camel caravan route. Famously, Zagora claims, as indicated by a sign posted in the town, it is 52 days (by camel) from Timbuktu, Mali. The Anti-Atlas Mountains lay in southern Morocco. The range extends in a north-easterly direction from the Atlantic coast south of Tiznit towards Ouarzazate and are bounded on their eastern side by the Draa River. The higher mountain peaks are around 2,500 to 2,700 meters. The High Atlas Mountain range is situated in central Morocco. The mountain range begins on the Atlantic coast near Agadir, extends in a north-easterly direction between Marrakech and Ouarzazate, continuing past Midelt toward Algeria. The highest of the mountain peaks exceed 4000 meters. The road from Marrakech to Ouarzazate and the Sahara Desert travels through the Tizi n’Tichka pass at 2260 meters. The Middle Atlas Mountains lay in the north of Morocco. Morocco’s Middle Atlas Mountainslay in a north-easterly direction from near Beni Mellal, passing to the east of Meknes and Fes, towards Guercif. The Middle Atlas Mountains have extensive cedar forests, home to the Barbary macaque. The cedar forests are said to be the largest southern Mediterranean forest and a remnant of a forest ecosystem that once extended through all Northern Africa, Spain, Turkey and Lebanon. (Ciani and Castillo, University of Padova, Italy). The landscape of the Dades Gorge is unique and hauntingly beauty. Incredible and surreal red rock formations line either side of the steep Gorge which is divided by the Dades River. 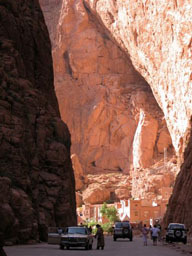 The Gorge is near the town of Boumalne Dades in central south Morocco. 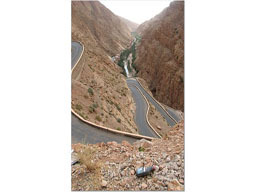 The road to Dades Gorge from Boumalne Dades passes by Berber ksars (fortified villages), almond and fig groves, enters the base of the Gorge and then snakes up the steep mountain side through a series of tight S-bends. You will be rewarded with stunning views of the Gorge from the viewing area along the top of the Gorge as well as from the road on the way up. The D’raa Valley carved by the ancient Draa River, the longest river in Morocco, is renowned for its many Kasbahs, oases and the dates, figs and henna that grow there. The beautiful date palm groves of the Draa Valley are like a green sea in the middle of the desert. During August and September, the thousands of date palms are laden with dates and the air heavy with the fragrant scent of henna flowers. The Rif Mountain range is Morocco’s northerly most mountain range. The rugged mountain range is roughly bounded by the Middle Atlas and Moulouya River in the east, Morocco’s Mediterranean Coast line in the north, Tangier in the west and Fes in the south. (Tingerhir) follows the clear Todra River waters which cut through the Gorge. The paved road extends a few hundred meters into the Gorge. It is possible to continue beyond the paved road by four-wheel drive or on foot. Located on the Fes – Errachidia road, the Ziz Valley runs south from the town of Rich through Erfoud to the desert village of Merzouga on the fringe of the Sahara Desert sand dunes. The Valley with its extensive palm groves and oases was once a route for the desert caravans travelling to the north and the Mediterranean.